The link between the Atlas Era and the Marvel Age draws ever closer with our sixth scare-filled collection of STRANGE TALES! Behind some of the most beautiful cover art in Bill Everett's storied career, each issue is packed with twist-ending tales that thrill and horrify. There are aliens, astronauts, girls, gangsters, police and poltergeists prepared to amaze you following every page turn. With artwork by a who's who of 1950s talent - from Ditko and Colan to Orlando and Crandall - it's as much a feast for the eyes as a shock to the senses. 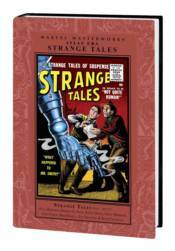 So reserve your copy today, or risk a comeuppance worse than death: no Strange Tales in your Masterworks library! Collecting STRANGE TALES (1951) #49-57.